Open the heart grille and discover the secret compartment that holds your aromatic oils. Simply place a fresh wick inside and add a few drops of the oil Breathe deeply and discover within yourself, the physical, emotional and spiritual harmony that is the ultimate secret of your well being. 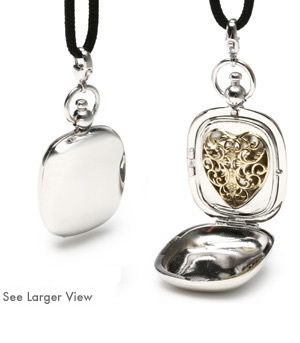 Remember this secret by engraving “The Secret of Well-Being Lies Within” on the locket cover, or make this piece a personal treasure with a monogram of your initials.